Ok so here goes... my first sewing tutorial... be patient with me and please please please ask questions if anything is not clear. There are 3 pattern pieces. Easy Easy Easy. A Hood. (make sure to cut a left and right side). These are the pattern pieces I made for my 9 month old. It is probably a 12-18 month size because my daughter tends to be a bit big for her age. Piece the pattern pieces together using tape lining up the letters: A - A, B - B, and so on. The Front and Back pieces are the same with the exception of the neckline. Print out two copies of the Poncho Body (5 pages). You will cut one on the solid line all the way around (this is your back). 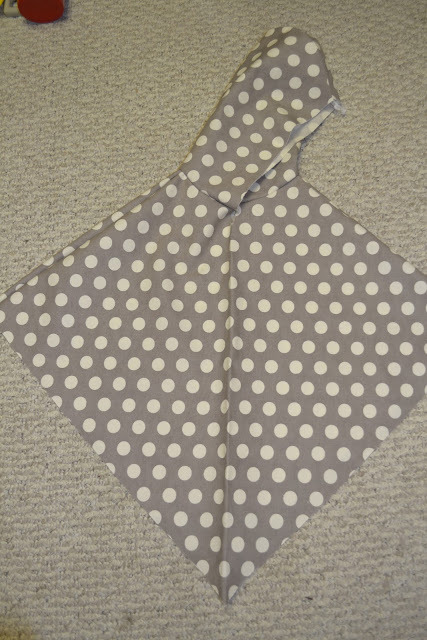 Cut the other one along the solid line except follow the dashed line at the neckline (this will be your front). You will need about a 3/4 yard for the inside and 3/4 yard for the outside fabric. 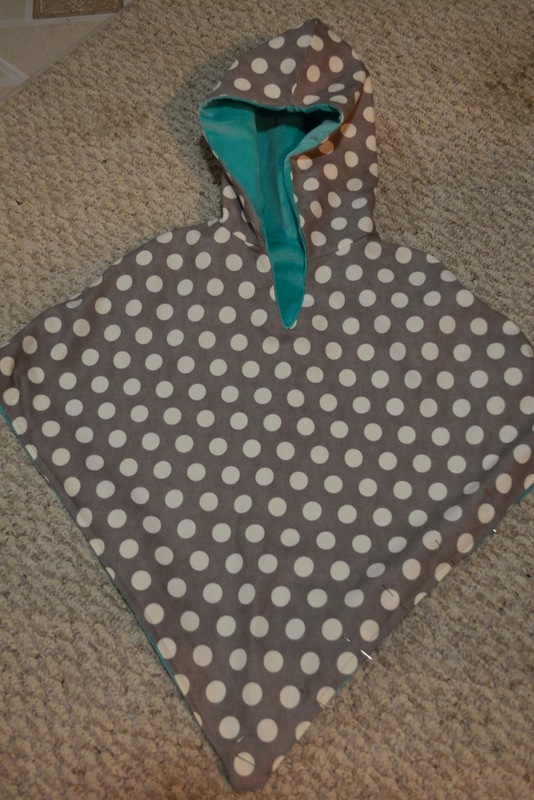 I used a grey and white polka dot for one side and a teal/aqua velour for the other side. Cut poncho front on the fold from fabric 1 and fabric 2 - you will have two fronts (one from Fabric 1 and one from Fabric 2). Cut poncho back on the fold from fabric 1 and fabric 2 - you will have two backs (one from Fabric 1 and one from Fabric 2). Cut two poncho hoods (left and right sides) NOT on the fold from fabrics 1 and 2 - you will have four hood pieces (two from Fabric 1 and two from Fabric 2). With the right sides together sew the poncho front and back together at the sides for fabric 1. Trim seam allowance to 1/4 inch (if using a serger skip this step). 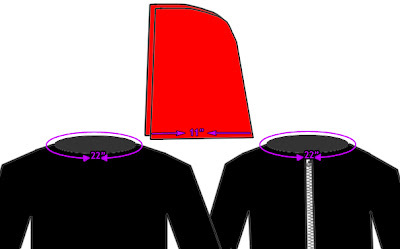 Trim hood seam allowance to 1/4 inch (if using a serger skip this step). You should now have two hoods and two shells of a poncho. One hood and poncho from fabric 1 and one hood and poncho from fabric 2. 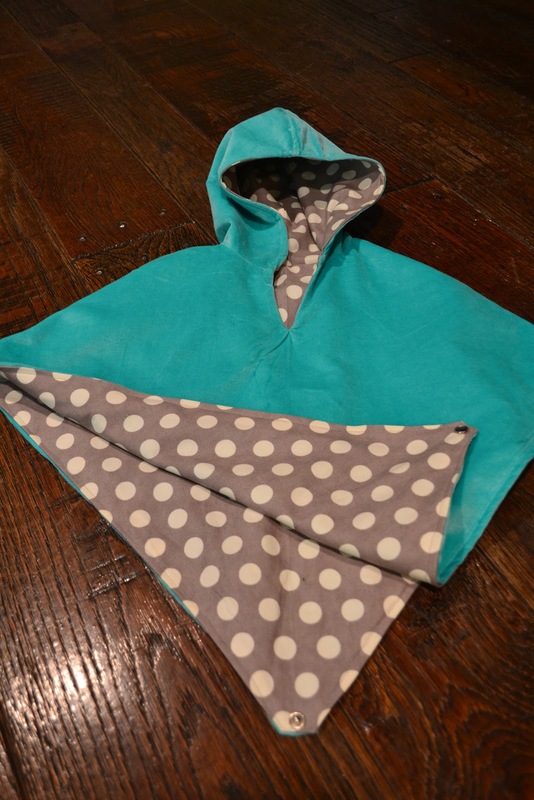 Pin hood and poncho from fabric 1 together with right sides together starting and ending at the center front of the neck. 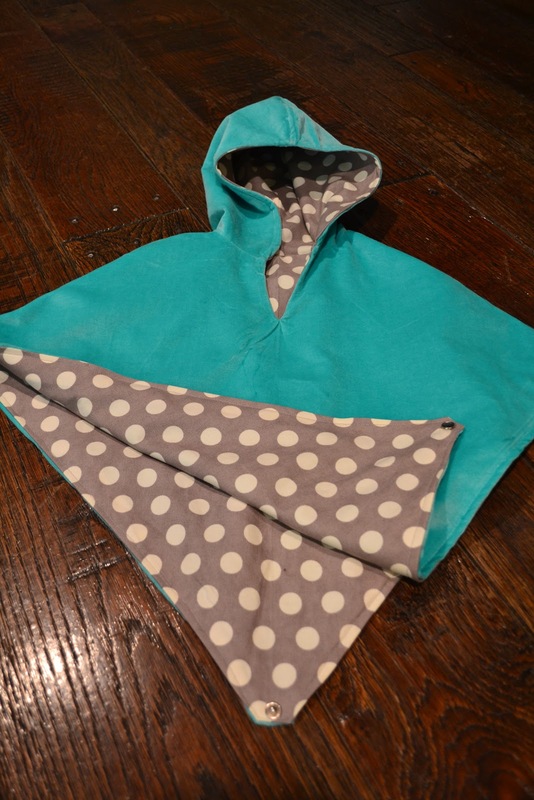 I don't have a good picture of this, but I found a website, What The Craft, that explains with good pictures how to attach a hood to a coat. 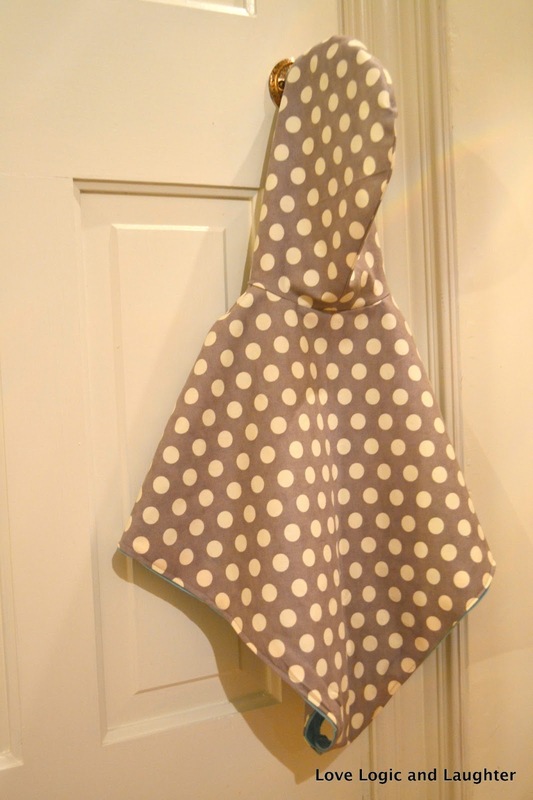 It is the same concept with starting and ending at the center front and shows good pictures on how to line the fabrics up - see two pictures above and check out the link. Now you have two poncho shells with hoods attached. One from fabric 1 and one from fabric 2. Turn poncho fabric 2 inside out. Place poncho fabric number 1 inside poncho fabric 2 so that the right sides are together. Line up the hoods and side seams. Sew around the edge of the hood opening (the opening for the face) all the way around the neck and into the "V" on the chest. Sew around the "v" a few times to reinforce the stitching. Trim the seam allowance at the "v" in the neck almost to the stitching. Turn the poncho right side out and iron. This picture was taken after it was turned right side out. 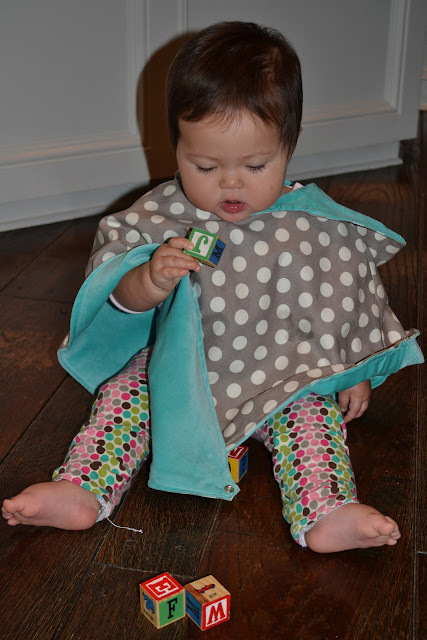 You need to sew around the "face" of the poncho when the right sides are together. Now you have one poncho with an inside and outside fabric. To hem the poncho you are going to turn both bottom edges in toward each other. Pin and iron. Stitch 1/4 inch from the bottom along the entire bottom of the poncho. Stitch along the seam on the back of the hood to keep the two layers of fabric together. Stitch along the side seams (arms) of the poncho to keep the two layers together. Add a snap (or button) to the crotch of the poncho. This is where the hem comes down to a "v" in the front and back. Hem comes to a point (a "V") in the front and the back. Please let me know if you have any questions and please post pictures if you end up trying this pattern - it is the first time I have posted pattern pieces I have made online and I am interested in how they work for others. Also, I think I may make another poncho for the winter. I may line it in fleece and make it warmer. I have been using this poncho all Fall with my daughter and it is nice even in cooler weather for a lighter coat over a dress when going to church or elsewhere. Thanks and Enjoy! Merry Christmas!!! 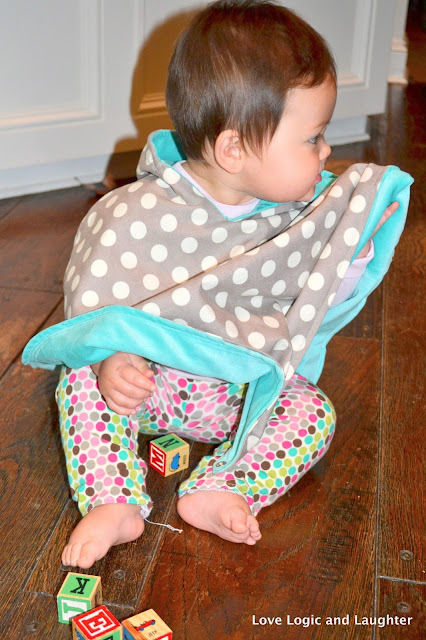 Your tutorial is the first hooded poncho tutorial that is fully reversible. Yay! I want to be sure I'm not crazy but when you sew around the hood (face/v neck) right sides together, couldn't you also sew around the perimeter of the body of the poncho, leaving an opening for turning right side out, then top stitch around the whole thing to close that hole? Oh yay!! I am excited to make this. I have some minky fabrics I want to try it with. I will post photos when I'm done. It will also be nice for the carseat!! I am sick of pulling coats on and off when we get in and out of the car. 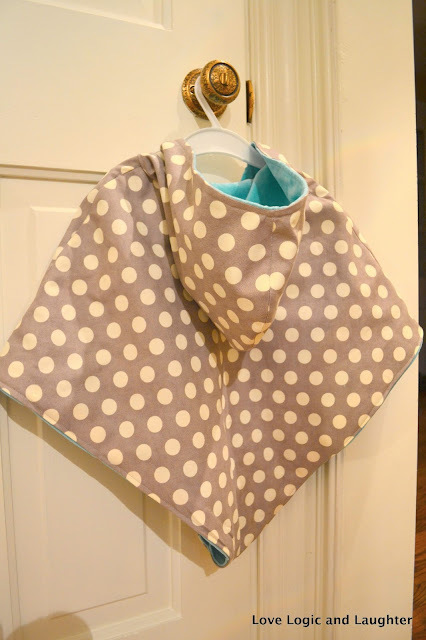 That was one of the reasons I wanted to make a poncho - for ease of on/off especially when getting in and out of the carseat! Can't wait to see your finished product - minky will be so nice and soft! love love love this baby poncho! is there a pattern for this sweet poncho? This is so cute...can I please have the pattern for it. I love, love, love it!!! !